2010 DFAL Results & Final Standings! Cougars enjoy lively competition to begin week of recovery after first five week training cycle of the fall season. Teams competed for prizes in the "ULTIMATE BALL" World Championships. Athletes armed with cameras and clue lists run amuck through Moraga during recovery week festivities after the second training phase of the 2010 cross country season. Photo album is HERE! Taking advantage of the school break, NCS bound athletes traveled to Concord's Newhall Park for a forty minute Mystery Fartlek session. With just one week until the 2010 Section Championships, and two weeks before the California State Meet, Cougar harriers discuss their post season expectations, as well as the current state of the squads. The Town of Moraga celebrated the success of the Campolindo athletic program by honoring the girls' NCS Water Polo champions, and girls' state Volleyball and Cross Country champions at the January council meeting. Proclamations were announced for each of the fall season teams, along with a recognition for individual state champion, Carrie Verdon (12). SportsImageWire: Check out professional xc photography, including pictures of Campolindo athletes at recent meets on: SportsImageWire.com! GOT PICS? Post them on the team Shutterfly page HERE! 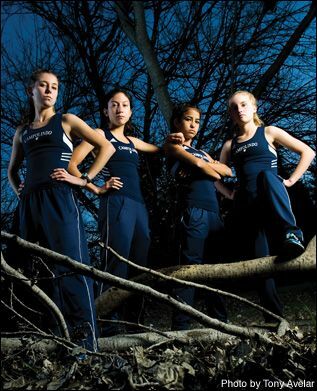 GIRLS FEATURED IN RISE MAGAZINE: NCS Champions enjoy the spotlight in January issue of national sports rag. Check out the photo shoot HERE!